Reduces "second-hand smoke" (sometimes referred to as "passive" or "involuntary" smoking) which is harmful to human health, posing a variety of health risks, ranging from cancer to emphysema to triggering asthma attacks, noting that the Surgeon General has determined that no amount of second-hand smoke is safe.? 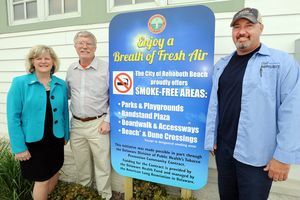 Pictured l-r: Deb Brown, President and CEO of the American Lung Association of the Mid-Atlantic; Stan Mills, City of Rehoboth Beach Commissioner; Mike Peterman, City Streets Department Supervisor. 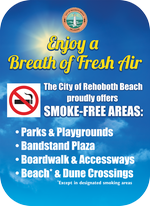 Therefore the Commissioners of the City of Rehoboth Beach established smoke-free areas within the city where smoking is prohibited. Smoking is defined as the burning of a lighted cigarette, cigar, pipe or any other matter or substance that contains tobacco. 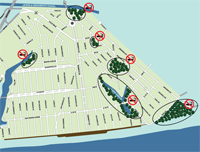 While voluntary compliance is expected, City code allows for issuance of citations for violations. Thank you for your observance of this law. Download our Smoke-Free Initiative Brochure for more information. 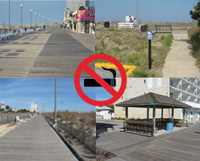 This smoke-free initiative was made possible in part through the Delaware Division of Public Health’s Tobacco Prevention Community Contract. Funding for the Contract is provided by the Delaware Health Fund and managed by the American Lung Association.